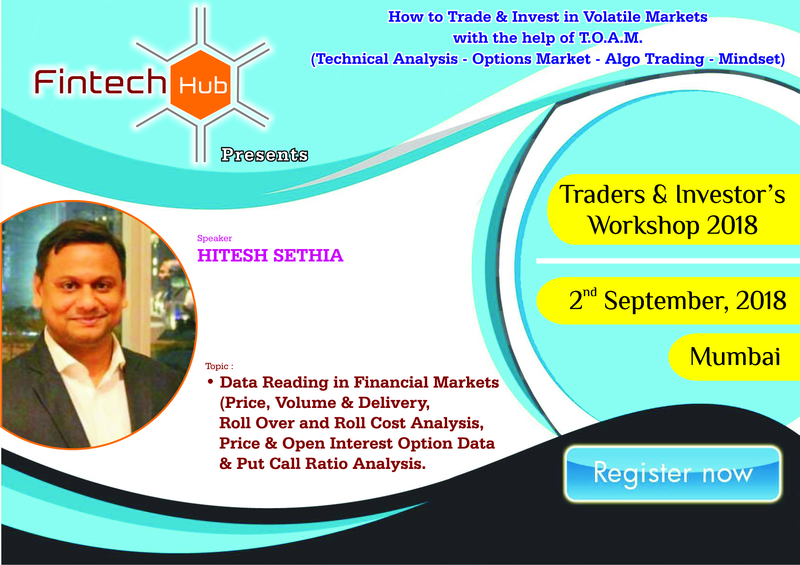 Fintech Hub presents Traders & Investors Workshop, Mumbai, 2018. Simplified Investing Techniques & Modified Trading Strategies. How to Trade & Invest in Volatile Markets with the help of T.O.A.M. (Technical - Options Market - Algo Trading - Mindset). Learn new ideas, concepts and process from India's Leading Market analysts, Experts & Celebrity Lecturers. Renowned Market Expert & Regular guest on CNBC TV-18, ET Now, Bloomberg TV, NDTV Profit, ZEE Business, CNBC Awaaz & Qualified Trainers at NSE,BSE, MCX and other International Exchanges. Are you a Full time Employed, Homemaker or Retired? Want to explore Financial Markets or Want to make a Full time or Part time Career as a Investor / Stock Trader or Stock Market Professional ??? 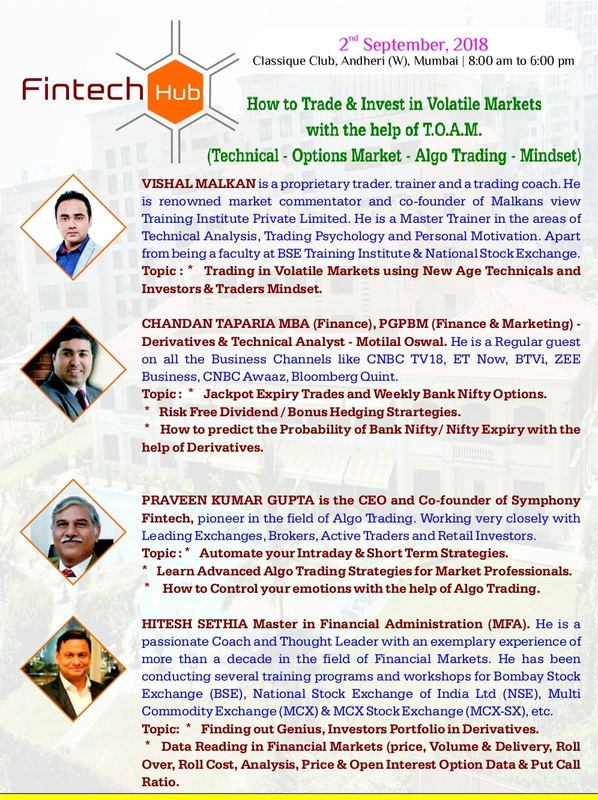 Wealth Creation through Stock Market Investing and Trading - The Eye Opener Investors & Traders Workshop, Mumbai 2018 will change your perspective of the market and bring positive change in your Trading & Investing ! Facilities : Breakfast, Lunch and Morning & Evening Tea/Coffee with Cookies. What you will Gain ??? Want to know how to make your money work with maximum returns? Want to know how to maximize profits while minimizing risks on an investment or trading Idea? Want to earn steady rent on your investment portfolios every month, just like properties? Want to learn Hedging Techniques for your long-term investments? How to Trade in Volatile Market. Winning Trades with help of Technical, Options and Algo. Wealth Creation in Volatile Market 2018-19. Systematic Risk Management with help of New Age Technology. ----> New Traders who are new to the markets. ----> Veteran Traders seeking new ways to profit during the greatest bull market of our time. ----> People who are new to Investing and also looking into trading who quite havent pulled the trigger and started trading yet. This is the perfect place to learn the framework of how to be a profitable trader! Financial Intermediaries, Media, Journalist & anyone who wants to learn trading and explore investing. In short, this event is for anyone who knows that this bull market is creating HUGE profit opportunities, and welcomes it with open arms! 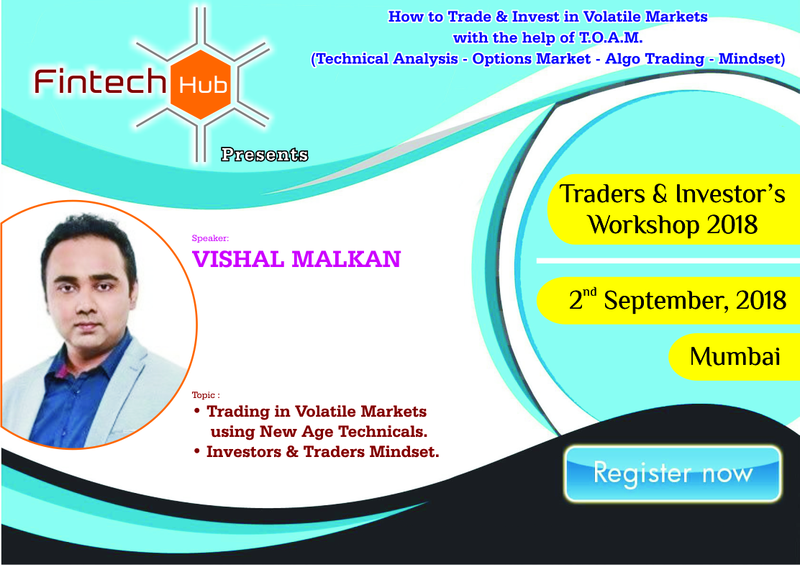 VISHAL MALKAN is a proprietary trader, trainer and a trading coach. He is renowned market commentator and co-founder of Malkansview Training Institute Private Limited. He is a Master Trainer in the areas of Technical Analysis, Trading Psychology and Personal Motivation. Apart from being a faculty at BSE Training Institute & National Stock Exchange he also regularly appears on Leading business channels. Topic: 1).Trading in Volatile Markets using New Age Technicals. 2). Investors & Traders Mindset. Chandan Taparia MBA (Finance), PGPBM (Finance & Marketing) - Derivatives & Technical analyst - Motilal Oswal Securities LTd. He is a Regular guest on all the Business Channels like CNBC TV18, ET Now, BTVi, ZEE Business, CNBC Awaaz, Bloomberg Quint. Regular writes for all leading newspapers and financial magazines like Economic Times, Business Standard, Mint, DNA, Financial express, financial chronicle. Topic: 1). Jackpot Expiry Trades and Weekly Bank nifty Options. 3). How to predict the Probability of Bank Nifty/ Nifty Expiry with the help of Derivatives. Praveen Kumar Gupta is the CEO and Co-founder of Symphony Fintech, pioneer in the field of Algo Trading. Working very closely with Leading Exchanges, Brokers, Active Traders and Retail Investors. Topic : 1). Automate your Intraday & Short Term Strategies. 2). 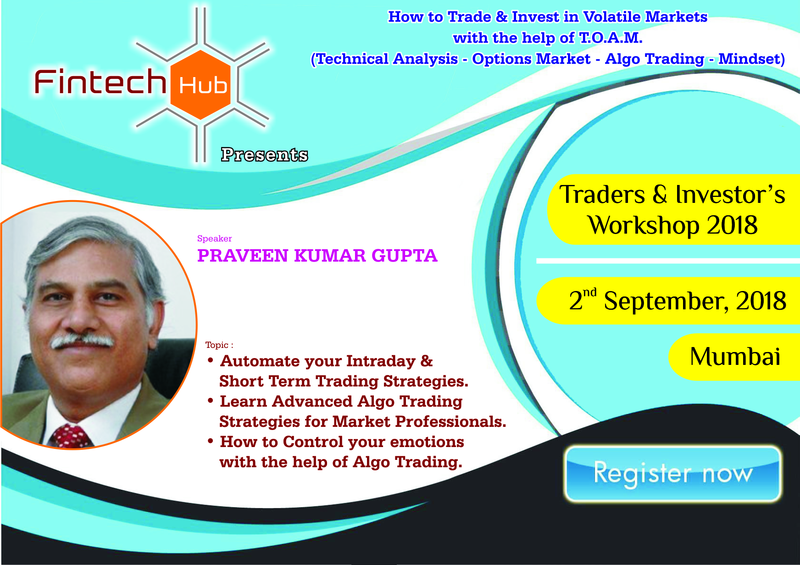 Learn Advanced Algo Trading Strategies for Market Professionals. 3). How to Control your emotions with the help of Algo Trading. Hitesh Sethia Master in Financial Administration (MFA). He is a passionate Coach and Thought Leader with an exemplary experience of more than a decade in the field of Financial Markets. He has been conducting several training programs and workshops for for Bombay Stock Exchange (BSE), National Stock Exchange of India Ltd(NSE), Multi Commodity Exchange (MCX) & MCX Stock Exchange (MCX-SX), etc He has conducted international training programmes for Global Board of Trade (GBOT) Mauritius, Singapore Mercantile Exchange (SMX) Singapore, and Strathmore University Nairobi, Kenya. Topic 1). Option trading and Strategies. 2). Finding out Genius Investors Portfolio in Derivatives. 3). Data reading in financial Markets (Price, Volume & Delivery, Roll over, Roll Cost analysis, Price & Open Interest Option Data & Put Call ratio. Save the date: Sunday, 2 September 2018 | 8:00 am to 6:00 pm | Venue : Classique Club, Andheri(W), Mumbai. Hurry Up !!! Limited Seats Available !!!! BOOK NOW !! !